When one thinks of corgis, the first thing to come to mind may very well be, “Isn’t that the breed of dog the Queen of England really likes?” That’s true, of course. But there are plenty of other fun facts to file away about the fluffy canines. For example: Fairies used to ride them into battle. That’s if you believe Welsh legend, anyway. According to the stories, a pair of corgis—specifically, the breed known as the Pembroke Welsh Corgi, as opposed to the Cardigan Welsh Corgi—were gifted to two human children by the “wee folk,” who used them for any number of tasks. In Glamorganshire and Carmarthenshire, Wales, bendith y mamau (“mothers’ blessing”; roughly pronounced ben-dith uh mah-may) is a generic term for all faeries. The other Welsh term for faeries is tylwyth teg (“fair family” or “fair folk”). Some see these two terms as synonymous. As in many faery legends, it was thought best to refer to the bendith y mamau with a flattering euphemism. In fact, there little that is “motherly” or “blessed” about these creatures. More often than not, they are, in fact, malicious and destructive in their dealings with mortals. According to some accounts, these creatures are a grotesque cross-breed of goblin and faery. They possess the glamour or illusion-magic of faeries but the stunted and ugly appearance of goblins. Some say they have an affinity with either brownies or the pisgies (pixies) of the West Country. The bendith y mamau are known to kidnap mortal children and replace them with their own hideous offspring, called crimbils. Stories suggest, however, that these mortal children might be returned many years later with only the faintest memory of their time among the Fair Folk. Bendith y mamau can be envious creatures, particularly of another’s beauty. They generally treat their captives well, however. These faeries are also associated with Welsh underworld hounds. These beasts, usually called cwn annwn (“hounds of the underworld”) are sometimes also known as cwn bendith y mamau or simply cwn mamau. The appearance of these spectral dogs is thought to be an omen of death. 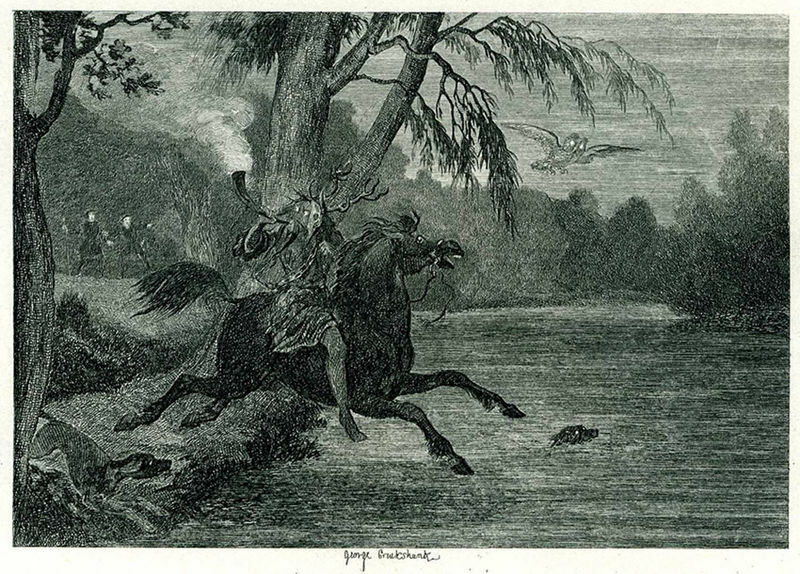 They are also associated with the Wild Hunt. Despite these unseemly characteristics, these faeries are also often skilled musicians and singers. Their music is capable of producing a trance-like reverie that erases a person’s memory, leaving them with only a faint recollection of the sweet music itself. The daoine sídhe (Scots Gaelic, daoine sith) are said to be the descendants of the Tuatha Dé Danann (“People of the Goddess Danu”), a race of deities that figures prominently in Irish mythology. These gods are, in fact, common to various Celtic cultures. Danu herself was known as Dôn in Wales, for example. Both names go back to a Proto-Celtic form Danona. Likewise, the earliest Celts worshipped deities named Lugus (Lugh, Lleu), Noudans (Nuada, Nudd), Ogmios (Ogma, Eufydd), etc. They arrived in Ireland in the distant, mythic past. Some legends say they arrived in flying ships. At any rate, they brought with them several powerful magical artifacts: the Lia Fail or “Stone of Destiny” that helped select successive kings of Ireland, the spear of Lugh, the sword of Nuada, and the cauldron of the Dagda. After defeating the indigenous Fomorians, they became the undisputed rulers of Ireland. It is said that only iron weapons could injure them. The Tuatha Dé Danann were eventually defeated by the Iron-Age Milesians—the ancestors of the contemporary Irish—and driven to the Otherworld, which homeland they access via the ancient burial mounds that dot the Irish countryside. They continue to live, it is said, as invisible beings. In Irish thinking, the Otherworld is closer to this world at dawn and dusk. This is thus a special time at which sightings of these fae are more likely. Daoine sídhe or aes sídhe, both meaning “people of the mounds.” The simple term sídhe is also commonly seen. “Still-moving people” or “people of peace,” alternate interpretations of the term daoine sídhe. Cloan ny moyrn (“children of pride/ambition”) or adhene (“themselves”), names favored on the Isle of Man. The Fair Folk, the Good Folk, or the Good Neighbors. All of these terms are euphemisms to avoid using the straightforward Gaelic term siabhra (Irish) or siabhrach (Scottish) “faery.” Use of this term is thought to be far too forward for mortals to use with impunity lest the sídhe take notice of the perceived slight. By all accounts, the daoine sídhe are powerful magicians. In early Irish manuscripts, they are described as “gods and not gods.” They are generally described as stunningly beautiful, although they can also be hideous monsters. It is likely a duine sídhe can look like whatever he or she wants to. In addition, these fae are often accomplished shapeshifters.